Carrot chutney recipe – how to make carrot chutney for rice, idli, dosa, pesarratu, vada, paratha and chapathi. Chutney made of vegetables make a good accompaniment to a breakfast or a meal. I make carrot chutney when I have surplus carrots. 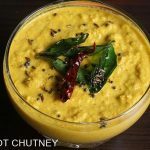 This chutney pairs well with most Indian breakfasts and even with roti or chapathi. It can be had with plain rice as well if made to a thicker consistency, that’s how we make carrot pachadi for rice. There are a few different ways you can make carrot chutney. I have shared 2 recipes in this post. 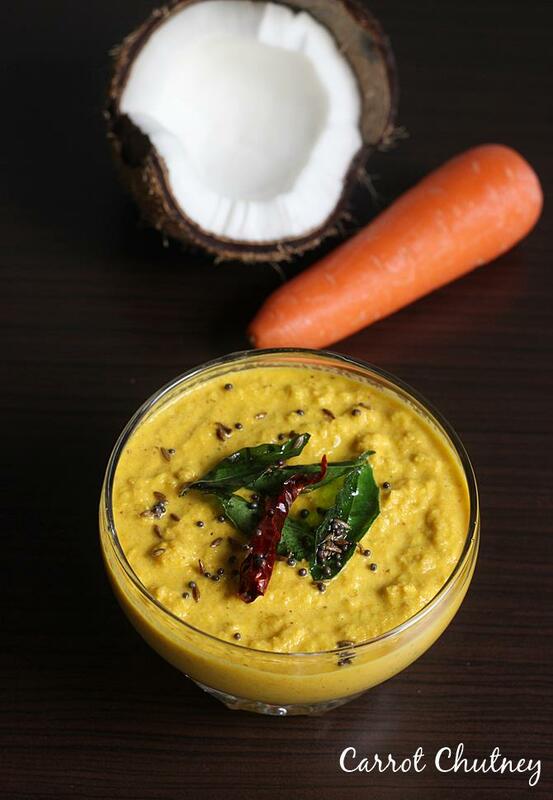 One way is to just add few chopped raw carrots to the regular south Indian Coconut chutney. The other one is to saute the carrots along with onions and chilies. Blend to a chutney. Lastly temper it for a good aroma. For a good tasting carrot chutney, please choose young, tender, sweet tasting and fresh carrots. Avoid using too old and fibrous carrots as they taste pungent or bitter. Carrot chutney is good for those who like to include more veggies in their diet. I do have fussy people at home so I make chutney with most vegetables. Carrot chutney makes a good accompaniment for any Indian breakfast or snack. Serve it with idli, dosa, vada, or with any snacks. 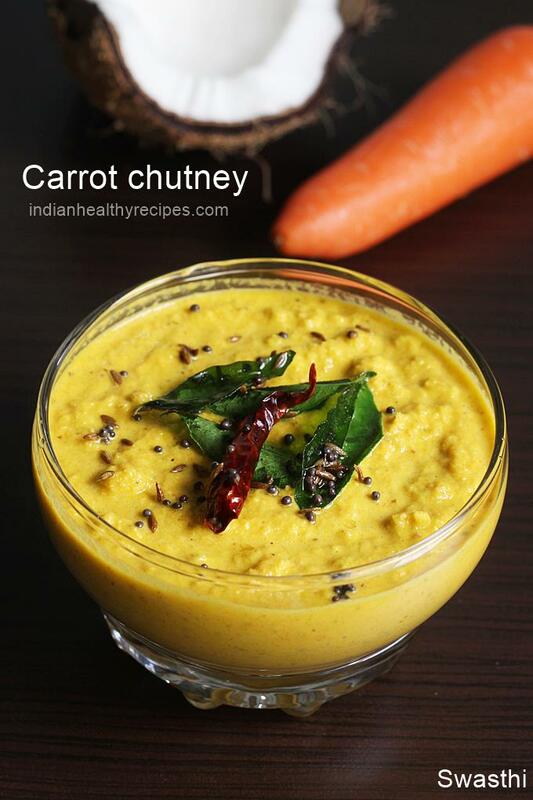 I have shared 2 recipes here to make carrot chutney. Heat a pan with 1 tsp oil. Saute chana dal until golden. Remove to a plate.Then saute onions and green chilies until they turn slightly pink. Next add in carrots & Jeera. Saute until slightly tender. If needed cover and cook. Cool all these and blend to a smooth paste with salt & tamarind. If needed little add water to bring it to consistency. If making for rice skip using water. 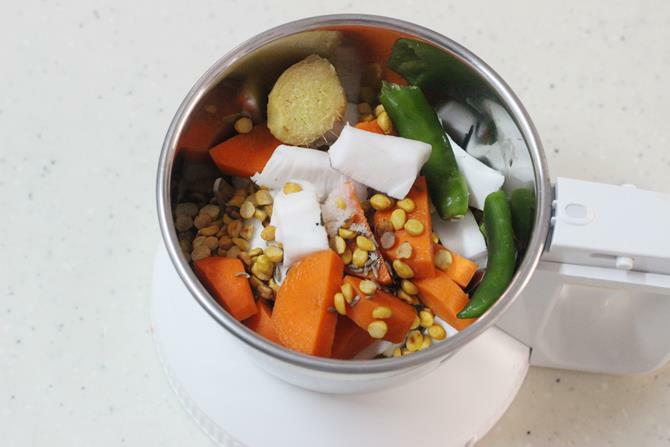 Add chopped carrot, coconut, fried gram, green chilies, ginger or garlic, salt, jeera and to a blender jar. Add tamarind. I do not use. Or pour 1 tsp lemon juice. Blend everything well to a smooth chutney. A thick pachadi goes well with rice, if making carrot chutney for rice, use little or no water. If making for breakfast, pour little water and blend. Heat a pan with oil, add mustard and cumin allow them to crackle. Add curry leaves. Fry till they turn crisp. Add hing and pour this over the chutney and stir. Carrot chutney needs tempering or tadka, since most ingredients used are raw. I suggest using up the chutney within 2 hours of preparing or needs refrigeration, Since raw carrots may not keep the chutney good for longer. I want to learn cooking for my husband.can you suggest me what recipe do i start with to be the best cook? I am very sorry for the late reply. I am very happy to know the recipes are useful. . As of now I do not have any plans for a cook book. Thanks a lot. where did u add ginger in this recipe?????? OMG swasthi, Now a days I find very hard to write a comment, coz the words to appreciate ur twisting recipe is very less with me. Ur simple recipes is also very tasty. Till today my none of the dish which I prepared from ur blog has gone wrong, the taste of the recipe is always a hit. I never thought the carrot would taste so AMA…ZING. I had this today morning with dosa. Carrot Chutney?? Wow! I need to make this for my hubby! Love your simple and easy recipes. Awesome pic!